Dessert is bad for you, so if you’re going to eat it, I think it should taste really good. It should be worth the butter and sugar. 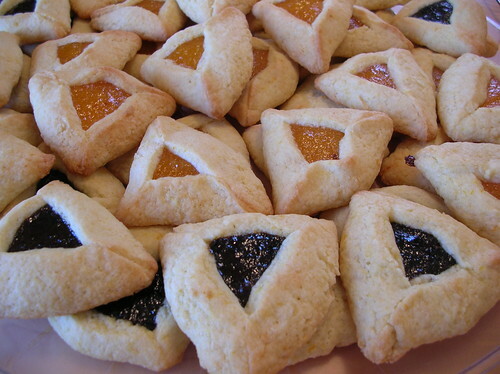 So, when the Purim party planning committee at our temple suggested buying hamentashen (triangular, fruit-filled cookies) from a bakery, I cringed. Then, much to Anne’s frustration, I volunteered to bake about 150 cookies for the party. And, because I’m crazy and a perfectionist, I decided we’d make the filling from scratch too. The thing is, once you’ve eaten really good hamentashen, it’s hard to go back to those flavor-less, cardboard-y cookies with gooey, cornstarch-y fruit filling from the grocery store or local kosher bakery. What makes these hamentashen so yummy is the orange zest and juice in the dough. As one of my co-workers once told me, it was the first time (ever) that he’d eaten a hamentashen where the cookie part actually tasted good. 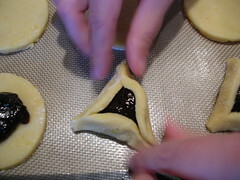 Traditionally, hamentashen come with three fillings: apricot, prune and poppy seed. You can fill them with whatever you like, though. 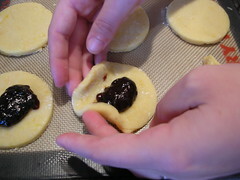 Some people will tell you to use jam to fill your hamentashen, but I have had bad results using jam. Because of the high sugar content, the filling tends to bubble out and burn in the hot oven. If you live in a neighborhood with a sizable Eastern European population, you can probably buy Solo brand filling in your local grocery store. It works very well, and you can also order it from the company’s website in many flavors. If you can’t get Solo filling (and you don’t want to make your own), you can use canned pie filling, but you should whiz it up in the food processor so it’s smooth. But if you’re getting out the food processor, you might as well make your own filling. It tastes so much brighter and fruitier than the canned stuff, and it’s totally easy. You combine dried apricots (or prunes) with equal parts water and sugar, cook it for ten minutes in the microwave, whiz it up in the processor and add lemon juice and almond extract. The recipe is in the Urban Feed archives, as part of the Danish braid recipe. To make prune filling (which is my favorite — it tastes so wonderful with the orange in the cookie), substitute prunes for the apricots in the recipe and replace the almond extract with vanilla extract. Combine orange juice and beaten egg. 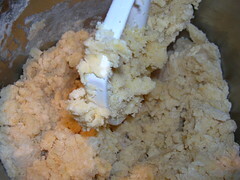 Add these wet ingredients to the dough and mix until a dough is formed. Shape the dough into a disc, wrap in plastic and chill 2 hours or overnight, if possible. Grease two cookie sheets (or line with Silpats or parchment paper). Position oven racks in the upper and lower middle positions and pre-heat oven to 400º. On a well-floured surface, roll dough out to about 1/8” thickness. (If you chilled the dough over-night, you’ll need to let the cold dough rest on the counter 5 – 10 minutes to warm up a bit). Using a 3” circular round cutter, cut dough into circles. Gather scraps together and re-roll until all the dough has been used. (If the dough gets too warm, re-chill it for 15 minutes). 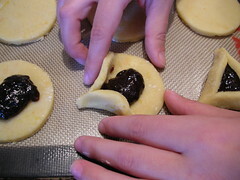 Place about 1 (scant) teaspoon of filling (use Solo filling, pie filling or make your own) in the center of each circle. Carefuly fold the circles into triangles. Place cookies on cookie sheets and bake 12 – 15 minutes, rotating top to bottom about half way through, until delicately browned on top. Let cool on sheets about 2 minutes then transfer to a wire rack to cool completely. This makes about 24 hamentashen. The recipe doubles easily. This entry was posted in baked goods, cookies, dessert, orange, Uncategorized. Bookmark the permalink. This is a great recipe. 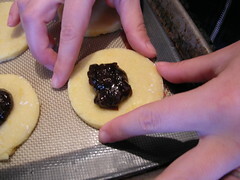 I also made the prune filling using your recipe. My cookies were done in 8 minutes. Yum! Also had excellent results with this recipe–including the apricot filling. The name isn’t hyperbole–these are the best hamentashen I’ve ever had. Thanks a lot for the recipe! The hamentashen I made with it turned out wonderfully 🙂 I used date spread for the filling, and the dough matches the flavor very well. I did end up cooking them at a slightly lower temperature, and gave them a few extra minutes as well. They turned out more browned than the ones in your picture, but still soft inside. I made the filling two days ago, the dough yesterday and the cookies today! So worth the work and time for delicious cookies. I googled the recipe because my Dad (Baker by trade) is coming over here for birthday dinner & dessert and he used to make them at his bakery. 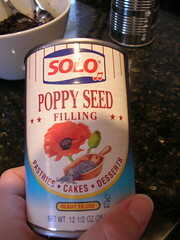 I was reminiscing about the ones he made with fig and cherry fillings. Of course his recipes are scaled up for a 50 quart mixer and so I just found your recipe easily. I made the apricot filling with unsulphured apricots & glad for that tip to not use Jam because of it being too runny & too sweet. Thanks again for the photos and detailed instructions. Can’t wait to have a cup of cappuncino with them while enjoying it with my family.